Crown Fast Cruise - View timetables, Compare and book ferry tickets at directferries.ie. 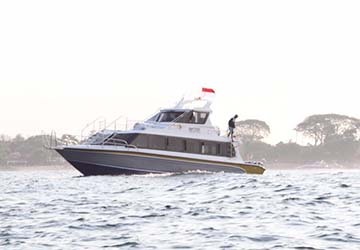 Many ferry companies are in operation around Bali, however, few cater to passengers travelling from the upscale resorts in Sanur to the rarely visited island of Nusa Penida, laying just to the southeast of Bali. Crown Fast Cruise provide a reliable and efficient crossing for this ferry route, which is part of the reason for their growth into one of Indonesia’s most respected operators. The sailing across the Badung Strait from Sanur to Nusa Penida is only around 30 minutes, so there are limited facilities and amenities on board, however, the spectacular vistas afforded from the deck are enough entertainment to keep you occupied on your journey. Whilst admiring the stunning surroundings, you can sip on the complimentary mineral water supplied by the warm and welcoming members of staff. Up to 70 passengers can board the vessel at one time, each person well looked after with up to 80 life jackets, three fire extinguishers and two life rafts to ensure passengers safety is of upmost importance. Each passenger is also guided before they even step foot on the boat; a shuttle service collects guests from their resort and transports them to the terminal, as well as making the trip to their accommodation once they land. With directferries.ie you can find Crown Fast Cruise timetables, fares and book Crown Fast Cruise ferry tickets. Where applicable we’ll also compare Crown Fast Cruise with alternative ferry companies.